KTRK-TV, virtual channel and VHF digital channel 13, is an ABC owned-and-operated television station located in Houston, Texas, United States. The station is owned by the ABC Owned Television Stations subsidiary of The Walt Disney Company (through its Disney-ABC Television Group division). KTRK maintains studio facilities located on Bissonnet Street in Houston's Upper Kirby district, and its transmitter is located in unincorporated northeastern Fort Bend County (near Missouri City). 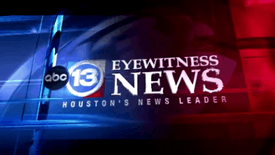 The station grew out of the Federal Communications Commission-imposed VHF "freeze", when three entities vying for the channel 13 assignment, including the Houston Chronicle, decided to merge as Houston Consolidated Television. The group also bought the studio facilities of KNUZ-TV (channel 39), a DuMont affiliate which had gone dark. The station first signed on the air on November 20, 1954 as KTRK-TV; as the Chronicle was the largest shareholder in the company, the callsign was derived from the Chronicle's radio station, KTRH. The station has been aligned with ABC since its debut; during the late 1950s, the station also had a brief affiliation with the NTA Film Network. The station's original studio facilities were located at 4513 Cullen Boulevard (at the defunct Texas Television Center district on the University of Houston campus); this studio later housed KHTV (now KIAH, the present channel 39) and PBS member station KUHT (channel 8). In 1955, the Chronicle bought out its partners. Although this theoretically left the paper free to change its callsign to "KTRH-TV" to match its radio sister, it opted not to. However, for years it called itself "The Houston Chronicle Station." Soon afterward, the station moved to its current Bissonnet Street facility. The studio was the first domed structure in town, predating the better-known Astrodome by ten years. Both projects were built by the same architect, Hermon Lloyd. Like many stations located on "unlucky" channel 13, it used a black cat as its mascot. Kitirik: a children's program, hosted by an actress in a cat costume. Cadet Don: A space-themed children's adventure program that focused on the exploits of an interstellar adventurer and the locations he visited. His alien puppet friend Seymour was from the planet Katark. Dialing for Dollars: A game show of sorts where a viewer would be phoned by the host and would win a cash prize by answering questions. Good Morning Houston: The successor to Dialing for Dollars, which debuted in the late 1970s and expanded to include discussions on local events and topics important to viewer's lifestyles. KTRK-TV's studios in the Upper Kirby district. In 1967, the Chronicle sold KTRK to Capital Cities Broadcasting (later to become Capital Cities Communications). KTRK's introduced its "Circle 13" logo – which is loosely patterned after the Circle 7 logo long used by ABC stations and affiliates broadcasting on channel 7 – in 1971; the original version, used until 1995, was a crooked "Circle 13" that recalled livestock branding of the Old West and was set in a Helvetica typeface, with the bottom of the "3" trailing off outside the circle (similar also to the way the stem of the number 7 terminates at the bottom of the Circle 7 logo). Under Capital Cities ownership, KTRK pre-empted some ABC programs, though not nearly as much as some of the network's other affiliates, such as Philadelphia sister station WPVI-TV. The programs that channel 13 declined to air were not widely run in many markets, though KTRK did pre-empt the first half-hour of Good Morning America in favor of a local newscast, continuing into the early 1990s when the newscast was moved to a pre-7 a.m. start time. After 1991, the station's only regular preemption was the first half-hour of The Home Show, an arrangement which continued when the show morphed into Mike and Maty. Despite these pre-emptions, ABC was more than satisfied with KTRK, which was one of its strongest affiliates. Capital Cities bought ABC in 1986, making KTRK an ABC owned-and-operated station and the first network-owned television station in the state of Texas. That year, the trailing portion of the station's logo was "trimmed" and was turned slightly horizontal in a similar fashion to the present-day version (the logo began to be superimposed over a stylized version of the Texas state flag on July 3, 1992). Capital Cities/ABC was sold to The Walt Disney Company in early 1996. Not long after, the new Disney-led ownership directed KTRK-TV to clear the entire ABC schedule, though there have been instances where local special events have aired in place of network programming (the annual running of the Chevron Houston Marathon is one notable example of this as live race coverage, anchored by the station's news team, pre-empted the Sunday edition of Good Morning America). On April 30, 2000, a dispute between Disney and Time Warner Cable resulted in KTRK being pulled from TWC's Houston service area for over 24 hours. Other ABC stations in markets served by Time Warner Cable, such as New York City, Los Angeles and Raleigh-Durham, were also affected by the outage before the FCC forced the provider to restore the affected ABC stations to those areas on May 2 (Time Warner traded the Houston franchise to Comcast in exchange for the latter's Dallas-Fort Worth system in 2007). KTRK-TV discontinued regular programming on its analog signal, over VHF channel 13, on June 12, 2009, as part of the federally mandated transition from analog to digital television. As most of ABC's owned-and-operated stations moved their digital channels to their former analog allocation post-transition, the station's digital signal relocated from its pre-transition UHF channel 32 to VHF channel 13 for post-transition operations. KTRK has long differed from many ABC-owned stations in that it never aired The Oprah Winfrey Show, which had been a staple on all of ABC's other O&Os since 1986 (having its roots in a morning show hosted by the titular host on sister station WLS-TV in Chicago) until it left the air in 2011. Until 2015, it also never carried the current syndicated editions of Jeopardy! and Wheel of Fortune, also mainstays on ABC's O&Os for around the same time period. All three programs, distributed by CBS Television Distribution and predecessor company King World, have aired instead on CBS affiliate KHOU (channel 11) since 1986 (the latter two began on NBC affiliate KPRC-TV) and were crucial to KHOU's rise from one of CBS's weakest affiliates during the 1980s to one of its strongest by the 1990s. In fact, at one point during the late 1980s until 1992, Donahue was the only syndicated daytime program on KTRK's lineup. This was largely due to its hour-long 6 p.m. newscast (which debuted in September 1982) as well as its popular movie showcases and local programming at the time, including Good Morning Houston and the Million Dollar Movie which aired at 3 P.M. over two hours from mid-April 1977 to September 1992 (from September 1972 to mid-April 1977 it was aired at 3:30); Oprah traditionally aired on 4 p.m. on ABC's other O&Os in addition to KHOU. Starting on September 14, 2015, KTRK began airing Jeopardy! at 3 p.m. before Inside Edition, making KTRK the last ABC-owned station to carry the long-running quiz show. However KHOU, which is expanding its 4 p.m. newscast to one hour in place of Jeopardy!, will continue to air Wheel of Fortune in its traditional 6:30 p.m. time slot, making Houston the largest TV market where both game shows don't air on the same station. Despite the cancellation of the Million Dollar Movie by 1992, KTRK nonetheless filled the two hours (as well as that of Good Morning Houston which it canceled in 1993) with talk shows hosted by Sally Jessy Raphael, Geraldo Rivera and Jerry Springer, and also picked up The Rosie O'Donnell Show in 1996, eventually airing opposite Oprah at 4 p.m. Since debuting its 4 p.m. newscast in 2001, KTRK was left with only three hours of programming outside of local and ABC programs, mainly distributed from corporate sibling Disney–ABC Domestic Television and its predecessor Buena Vista Television, including short-lived talk shows from Wayne Brady, Tony Danza and Katie Couric as well as the syndicated edition of Who Wants to Be a Millionaire, itself a former ABC network program. It would not carry Live! (which is produced by sister station WABC-TV in New York) until 2002 when KTRK gained the Houston rights to the show from KHWB (channel 39, now KIAH). KTRK has been the official television home of the Houston Texans since it inaugurated play in 2002. The station has televised all of the NFL franchise's preseason games that are not carried on national television since the team's inception. In addition during the Texans' regular season, KTRK airs the post-game show Houston Texans Inside the Game (hosted by sports director Greg Bailey and Spencer Tillman) on Sunday nights at 10:35 p.m.; a recap where Bailey and Texans head coach Bill O'Brien review the previous Sunday's game during KTRK's 6 p.m. newscast the day following the Texans game (usually on Mondays); and Extra Points: Houston Texans Edition, an extension of its sports program Extra Points, on Saturdays at 6:30 p.m. Historically, KTRK was the original television home of the Houston Astros, from the team's inaugural season in 1962 until 1971; however, the station only aired the team's Sunday afternoon road games. 13 Eyewitness News former newscast title card. KTRK presently broadcasts 42 hours of locally produced newscasts each week (with 6½ hours on weekdays, five hours on Saturdays and 4½ hours on Sundays). The station's newscasts have been #1 in the Houston market for much of the last 30 years, and are also among the highest-rated newscasts in the country. KTRK ranks in first place among various demographics such as men and women 18 to 49 and 25 to 54 years old, African Americans and suburban audiences. In addition to KTRK's longtime ratings dominance in news, KTRK ranks #1 sign-on to sign-off and often is ranked places first in primetime viewership, outperforming ABC's national primetime ratings. 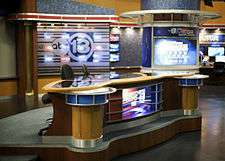 Channel 13 is widely noted for having the most experienced news team in the Greater Houston market. Many of the station's anchors and reporters have been at the station for at least 20 years, some even dating back to KTRK's days under Capital Cities ownership. Dave Ward has been the station's main anchor since 1968, the longest tenure of anyone in American television history. 13 Eyewitness News set in December 2009. KTRK also became known for its legendary consumer and investigative reporter, Marvin Zindler, whose week-long reports on a La Grange brothel in 1973 led to the closing of the Chicken Ranch, a bordello that was later immortalized in the musical and film, The Best Little Whorehouse in Texas and ZZ Top's hit song "La Grange." Zindler was also widely noted in the Houston market for his Friday night Rat and Roach Report focusing on Houston restaurants that have failed health inspections, which ended with his trademark line "Slime in the Ice Machine". Zindler signed a lifetime contract with KTRK in 1988, making him the first person ever offered such a contract by then-owner Capital Cities, which had a reputation for being a financially frugal company. Zindler continued to work for the station until his death from pancreatic cancer in 2007, even filing reports from his hospital bed during treatment. As of 2013, the station's consumer reporting is now handled by "Action 13" consumer investigator Jeff Ehling and "Stretch Your Dollar" feature reporter Patricia Lopez. During the 1970s and 1980s, Ward, along with Zindler, sports director Bob Allen and weatherman Ed Brandon, led KTRK to the #1 position at 6 and 10 p.m. Live At 5 debuted in mid-April 1977. The lineup was later revised to include a female anchor, Shara Fryer, in the 1990s; followed by current chief meteorologist Tim Heller in lieu of Brandon at 10 p.m. in 2002, and the replacement of Fryer with Gina Gaston the following year. In 2007, Brandon retired from the station after a 35-year career, but has occasionally served as a fill-in weather anchor. Allen later left KTRK and was replaced as sports director by Greg Bailey on September 4, 2012. On August 12, 2007, KTRK became the first telelvison station in the Houston market to begin broadcasting portions of its local newscasts in high definition, becoming the seventh ABC-owned station to make the transition. On August 17, 2009, KTRK became the first station in the market to expand its weekday morning newscast to 4:30 a.m. In January 2014, KTRK expanded their weekend 10:00 p.m. newscast to one hour. Wayne Dolcefino – 13 Undercover investigative reporter (1985–2012), currently working for media relations for the City of Houston. ↑ "Harris County Improvement District #3." Upper Kirby. Retrieved on December 10, 2008. ↑ "Grant proposed for Houston TV Co." Broadcasting - Telecasting, January 18, 1954, pg. 56. ↑ "Require Prime Evening Time for NTA Films". Boxoffice: 13. November 10, 1956. ↑ "Capital Cities buys KTRK-TV in Houston." Broadcasting, November 21, 1966, pg. 9. ↑ "Capcities + ABC" and "FCC approval of CapCities/ABC deal likely." Broadcasting, March 25, 1985, pp. 31-34. ↑ The Media Business: The Merger; Walt Disney to Acquire ABC in $19 Billion Deal to Build a Giant for Entertainment, The New York Times, August 1, 1995. ↑ "KHOU is letting go of Jeopardy! for more local news at 4:30 p.m.". The Changing Newscasts Blog. Roly Ortega. Retrieved 2 September 2015. ↑ "Dan Rather Biography". Retrieved 13 March 2013. 1 Owned by Lotus Communications Corp., operated by Disney under an LMA. 2 Owned by Entercom, operated by Disney under an LMA. 3 Owned by Emmis Communications, operated by Disney under an LMA. AaBbCc Operated by Cumulus Media under LMA. AaBbCc Clear-channel radio stations with extended nighttime coverage.